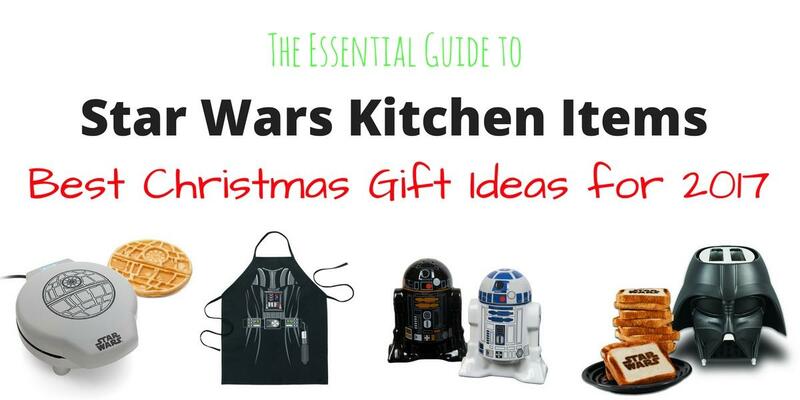 With so many choices you can give everyone in the family different Star Wars kitchen gadgets and make your Christmas shopping easy. ⇒ Need to buy amazing Christmas presents in a hurry? See here for the best Star Wars kitchen gadget ideas. This is the best link to make life easier at this time of the year! Do you like waffles for breakfast? Make them more interesting with a Star Wars waffle maker. There’s Darth Vader, the Death Star, a Stormtrooper, BB-8 and more to choose from. If your family is like ours, you’ll need to get two Star Wars waffle makers because the kids can’t decide on just one between them. We make waffles in two of them at the same time and everyone loves their Star Wars waffles. 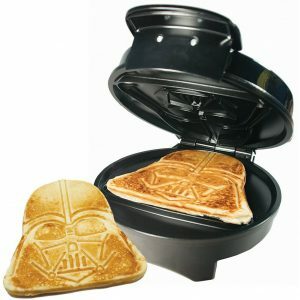 I love this Darth Vader waffle maker. My kids love it too. I’m guessing it really wouldn’t matter whether you have kids or adults in your household, everyone will want a Vader waffle. This waffle maker has a regulating thermostat and weighted lid to ensure perfect and even browning. There are 5 temperature settings. You have control to make your waffles tender and golden or crispy and brown. The choice is yours with the turn of a dial. ☑ To see the latest price on this waffle maker, click here. If Lord Vader’s not your favorite, don’t worry, there are plenty of other choices in Star Wars waffle makers. These Star Wars waffle makers really do make such a great Christmas present. But if you have family or a friend at college, they are popular in a dorm room too. If Vader is too dark for your liking, perhaps you’d prefer BB-8. This Star Wars waffle maker cooks a cute BB-8 shape. It includes 5 temperature settings and a weighted lid for even heat distribution when cooking. There are dual indicator lights to show you when it’s ready to pour the batter and when the waffle is ready. 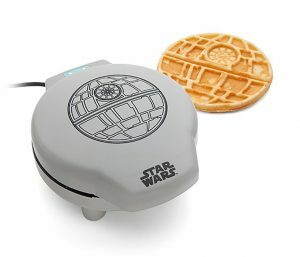 If you like a lot of waffle, the Death Star waffle maker is for you. With its circular shape there’s lots of room on top for fruit (the healthy option) or maple syrup (the tasty option). In our family we do both on top. This waffle maker creates good thick waffles. You’ll really enjoy eating them. ☑ To see the latest price on the Death Star, click here. Is a Stormtrooper more your style? I love that all these Star Wars kitchen items come in so many different character options. This waffle maker has a coated non-stick plate for easy cleaning. There are 5 temperature levels and dual indicator lights to show when to pour the batter and when the waffle is ready. Bon appetite. 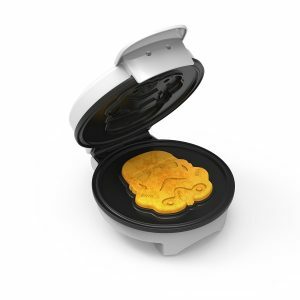 You can also use this appliance for eggs, brownies, cake and as a sandwich press. ☑ For a great price online, see here. If you don’t want the hassle of making waffles, what about a Star Wars toaster? These are some of the best Star Wars kitchen items available. Adults and kids love the Star Wars toasters. And you get to choose your favorite. In our family we really like Darth Vader using the force on our toast. This really is an all time favorite among many. This toaster will toast the words “Star Wars” onto one side of your toast. On the other side it will toast all the way across. That’s the dark side of the toast. The toaster features all the usual options you’d expect on a toaster. These include reheat, defrost and quick stop functions. The thermostat is adjustable. Of course, the toast pops up automatically. Also there’s a removable crumb tray for easy cleaning. 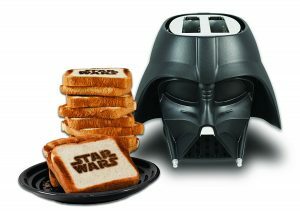 ☑ To see the latest price on this Darth Vader toaster, click here. Maybe a black toaster is too much of the dark side in your kitchen. What about a silver Death Star? This toaster looks fantastic and toasts a Tie Fighter onto the bread. The toaster is made by the same brand as the Darth Vader toaster above and it has the same features. Included are defrost, reheat and quick stop functions. 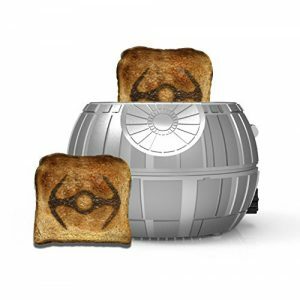 You’ll love the Tie Fighter toasted into your bread. The Tie Fighter appears on one side. And the other side toasts uniformly across the slice of bread. You’ll get an adjustable thermostat with this toaster and there’s a removable crumb tray. This is a very imposing piece for your kitchen. Striking detail makes this a standout appliance when your looking at Star Wars kitchen items. 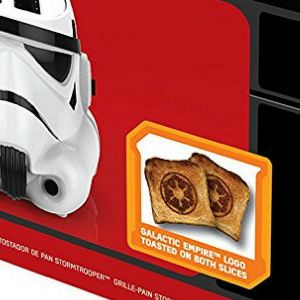 This Stormtrooper toaster leaves a picture of the Galactic Empire Logo on BOTH sides of your bread. 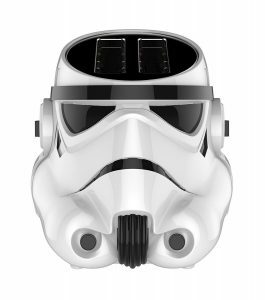 You’ll love the extra wide and long toaster slots in this Stormtrooper Star Wars toaster. You’ll be able to use all types of bread in it. It includes the usual defrost, reheat and quick stop functions. And of course, there’s a removable crumb tray. Because you don’t want a crumbie Stormtrooper. Here’s a picture of the Galactic Empire Logo it burns into your toast. Of course, none of these novelty toasters burn the picture onto the toaster as well as you’d like. They’re often a bit fuzzy as an end result. If you really want a good result, you’ll need to turn up the dial and leave it toasting for longer. However, not everyone likes their toast on the dark side. Having said that, about the logo never burning into the toast perfectly, you do need to remember they’re a novelty. Also the main feature for our family is the awesome toaster appearance sitting on our counter when friends come over. Everyone wants toast at our place! Have you seen these fantastic grilling accessories? They make great presents for Dads, Husbands, Boyfriends, Grandfathers, Uncles, Sons, Nephews – in our family these are always the most difficult people to shop for. They can never tell me what they want and they always seem to have everything anyway! Maybe it’s different in your family. Anyway, they still make great Christmas presents. Let’s start with this awesome grilling apron. We’re going with a Darth Vader theme here, so bear with me because it gets even better from here. 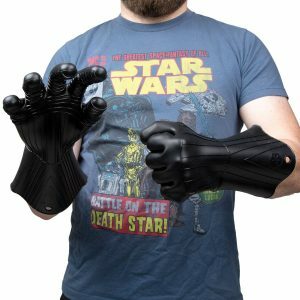 Now we move on to what I think is really exciting, the Darth Vader gloves. Don’t you love them? These are the best silicone oven gloves I’ve ever seen. They resist heat up to 445 degrees. Most of all, they just look so cool. 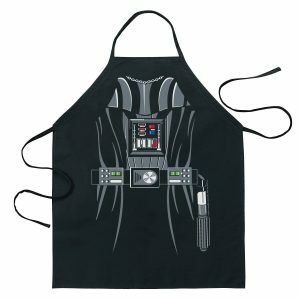 ☑ For a great price on these Darth Vader Oven Gloves, click here. Now let’s add Lightsaber BBQ Tongs and a Lightsaber spatula. The tongs also include Star Wars sound effects. You’ll love them. These are such a popular gift. 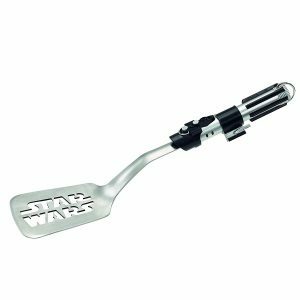 If you include the Lightsaber spatula for flipping burgers you’ll really complete the set. You can’t go past a theme present at Christmas, it will make a big impact. As you can see the Star Wars Lightsaber divides in half. They’re 22 inches long and the red light part is the cover for the tongs. 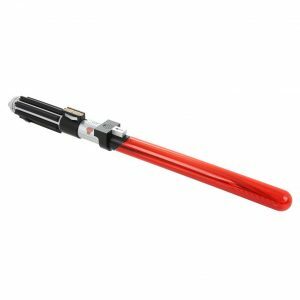 The Star Wars Lightsaber spatula is great for turning food on the grill. If you like cooking burgers, this will come in handy. 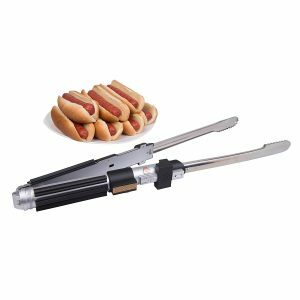 Also, this is the one of the Star Wars kitchen items you can easily use in the kitchen, as well as for grilling. Want to make your drinks more exciting? Need a conversation starter at your parties? Serve your guests Star Wars ice cubes. There are lots of designs to choose from. They also make great presents for Christmas. In our house the adults’ first choice is one large Death Star ice cube in a glass of whisky or in the middle of a cocktail. The kid’s favorite choice is the Millennium Falcon in a glass of soda. The little ones like a Star Wars R2-D2 ice cube, or two, in their glass of orange juice. These silicone molds are also great for making candy or you can use them as a chocolate mold. You can make jello in them and lots more. If you’re buying one mold I recommend buying a few more at the same time with different designs. 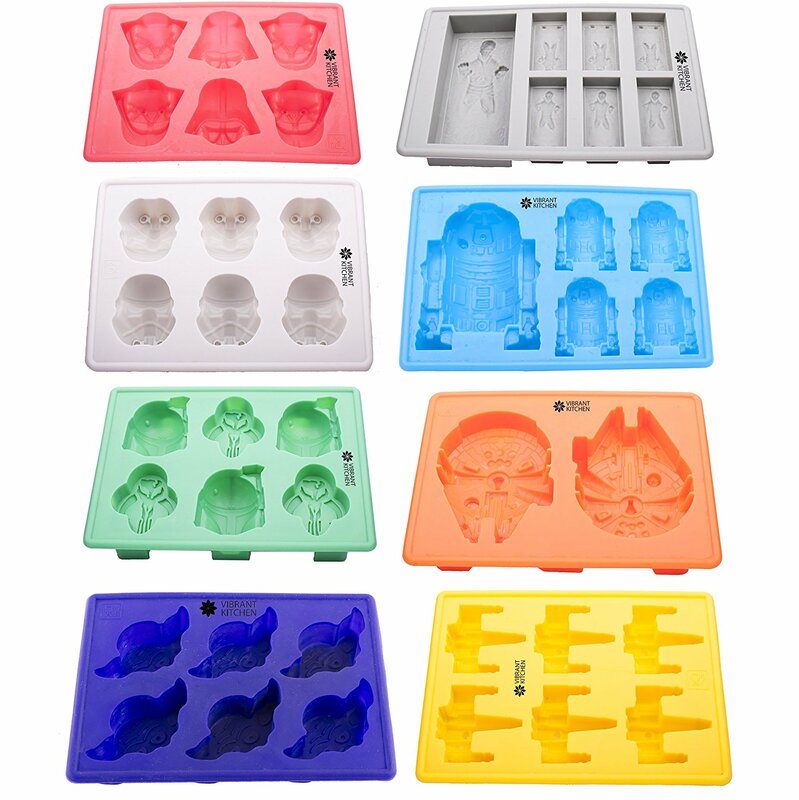 These molds are great for making ice or candy for Halloween or any other time of the year. Any day is a good day for Star Wars ice cubes. This is a fantastic set to start with (see photo below). 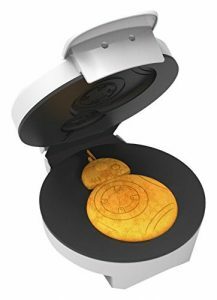 It’s great value and you get to use all your favorite Star Wars silicone molds straight away. My only suggestion is that you might want to buy extra Death Star molds. This set only includes one. You can, of course, make extra Death Star ice ahead of time and put them in a sealed plastic bag in the freezer to use the mold to make another one. But it is very time consuming and honestly, too frustrating for me to find the patience to wait around making individual ice cubes. So I recommend buying extra Death Star molds in addition to this set. You can buy extras for a few dollars and you’ll be pleased you did. 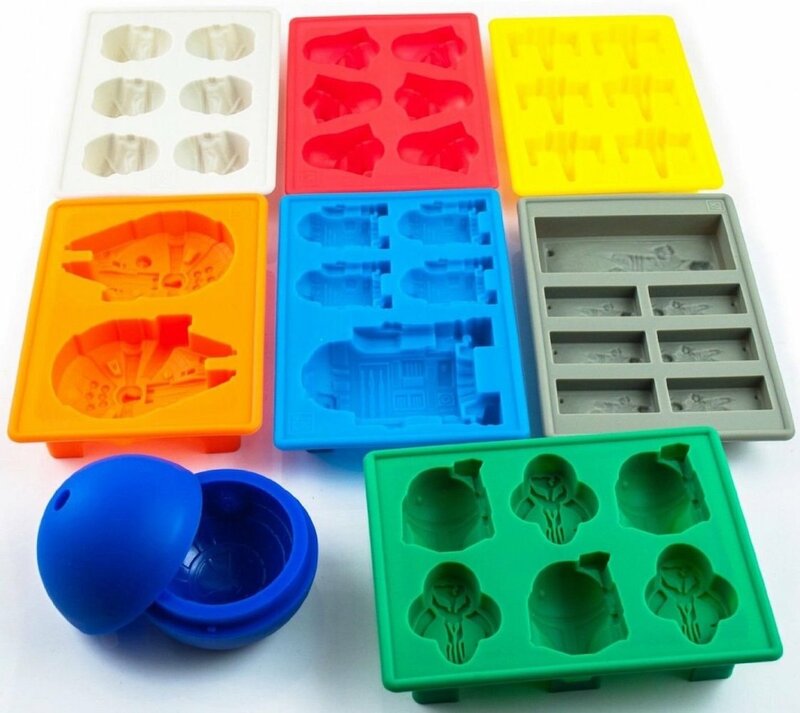 If you need extra Death Star silicone molds, see the sets below. You can chose to buy 1 more or a couple or a whole set. Lots of choices! As you can see you can buy an entire set of Death Stars if you need them. And yes, I did include a BB-8 silicone mold there too. It’s so cute, I think you’ll like it. Here’s another great value set that includes Yoda (see picture below). If your kids love Yoda (and who doesn’t), you’ll definitely want to consider this set of Star Wars silicone molds.